Virgin Galactic is proud to announce Under Armour as its Exclusive Technical Spacewear Partner to create a next generation of spacewear and astronaut performance programs. This exciting and exclusive collaboration brings together Virgin Galactic's mission to make commercial space travel a reality, with Under Armour's expertise in technical apparel and footwear, ensuring that astronaut customers and staff are fully equipped to maximise personal performance in a new age of space exploration. The partnership will also see Under Armour create uniforms for Virgin Galactic's world-class team at Spaceport America in New Mexico. Whether engineers, astronaut trainers and hosts, or mission control operatives, each member of the Virgin Galactic team will be wearing Under Armour apparel specifically chosen to enhance performance and to provide a tangible sense of shared purpose. As Under Armour crafts the Virgin Galactic collection, it draws inspiration from its strong heritage of innovative performance solutions for some of the world's top athletes. Under Armour will mimic the holistic approach it takes with those individuals and in addition to apparel will design programs for astronaut physical preparation and recovery with a focus on enhancing mobility, strength, fitness, nutrition, and sleep. The full range of apparel and footwear is set to be revealed later this year, ahead of Richard Branson's inaugural commercial flight. Commenting on the Under Armour partnership, Richard Branson said: "I have followed Under Armour's progress through a personal friendship with its CEO, Kevin Plank and via the great relationships it has established over the years with various Virgin companies. I've loved its determination to push technical boundaries in order to improve performance, so could not have been more pleased when Kevin and his talented teams stepped up to the considerable task of creating a range of space apparel and performance programs for Virgin Galactic. Our partnership is built on the firm foundations of shared values and it will be an absolute privilege to wear an Under Armour astronaut space suit on Virgin Galactic's inaugural commercial space flight." 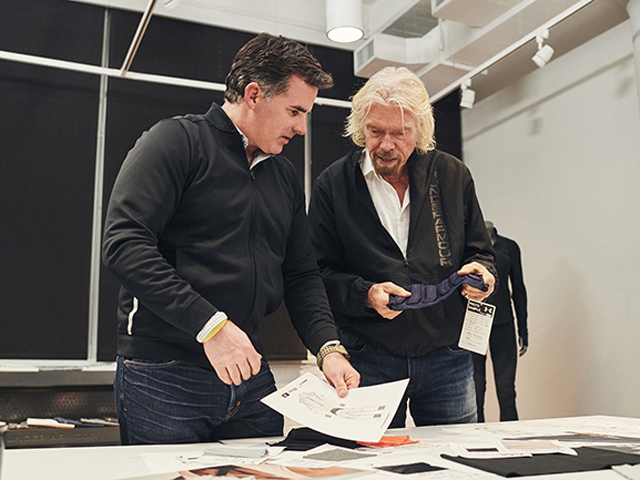 Kevin Plank, CEO, Under Armour said, "Working with Sir Richard and Virgin Galactic is an opportunity of a lifetime, one that has the entire Under Armour team across the world excited. This is a great opportunity to test our innovation at the highest level and continue to push the limits of human performance."